City-zens show up for eight-goal showdown! Maybe this is the game in which Manchester City learn to love the Champions League. What an occasion it was. A giant, twister of a match, of seemingly uncontrollable force and frenzy, City almost out of Europe one moment, stronger than ever and winning in style the next. City were 3-2 down after 60 minutes, 5-3 up after 82 – and Monaco missed a penalty. 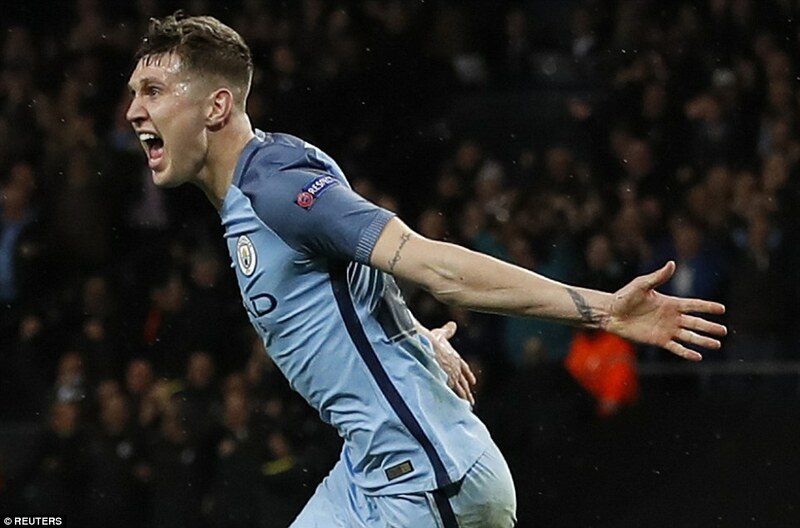 Reputations were made and trashed, sometimes within moments, but at the end Pep Guardiola’s side was, somehow, emphatically victorious. A word of warning, mind you. Against a Monaco team with this attacking potential, even two goals clear, this isn’t over. What a comeback it was. Three goals in 11 minutes before a delirious Etihad, at last seeing Europe’s greatest tournament as more than a vehicle to vent their anger at UEFA. If this doesn’t inspire them, nothing will. It was the greatest match here since Sergio Aguero’s famous title winning goal against Queens Park Rangers and, naturally, he was at the centre of it. For a start, he got City level when Monaco led 2-1. A fortunate goal, this, put away by Raheem Sterling but needing some hopeless handling from goalkeeper Danijel Subasic at the near post to put it away. Yet it wasn’t until Radamel Falcao had put Monaco ahead with a magnificent chip over Willy Cabellero, having eluded Nicolas Otamendi, that the storm truly began. Somehow, Monaco forgot City’s defensive vulnerability and allowed themselves to be pushed back. Fatal mistake. City are at their best going forward, too. And Aguero has a point to prove. 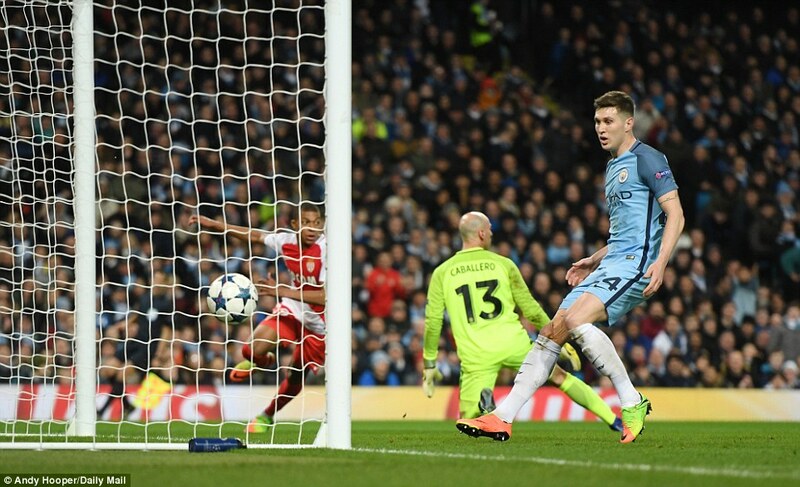 What a sweet strike it was to equalise again – volleying in a David Silva corner from deep, Monaco allowing him too much space. Now Guardiola’s men were as unstoppable as Monaco had once seemed. Another corner, this time from Kevin De Bruyne, was flicked on by Yaya Toure and converted by John Stones at the far post. Soon after, delirium unconfined, as Toure, Silva, Aguero and finally Leroy Sane combined in a wonderful passing move for the fifth. There have been a few revivals here, but not like this. For Falcao it was a night of many emotions. He has now scored as many goals in Manchester for Monaco as he did for Manchester United. And he should have had more. Only the most dreadful penalty stopped him getting a hat-trick here, passing his total for a season at Old Trafford, and maybe beginning the process of dumping Manchester City out of the Champions League. Instead, Falcao had to settle for two, Monaco for three and that miss turned the game. Otamendi committed the foul, but Falcao took an age to summon the focus to take it, and when he did it was almost a pass back to Willy Caballero, who could not have seemed more uncertain on other occasions. The biggest misapprehension, back in December, was that Manchester City had pulled an easy draw. Monaco are arguably the team in Europe right now, certainly in terms of attack. Their record of 76 Ligue 1 goals so far, puts them 26 ahead of Paris St Germain, conquerors of Barcelona, and even nine clear of Celtic in the one-team Scottish Premier. In all competitions, they have 108 goals this season – 100 by the end of the first half here. Ignore the penalty that City were denied or the odd what-might-have-been. City’s problem, and it is not going to go away, is that coach Leonaro Jardim has built a quite thrilling team at Monaco, full of invention and pace and quite magnificent finishing power. To see Falcao unleashed here is to wonder what became of the player bought by Manchester United and Chelsea. He scored almost as many goals for Monaco in Manchester in 45 minutes as he did for Manchester United in an entire season: one against two. He was aided in this by a sadly unsurprising defensive display from Pep Guardiola’s side – Willy Caballero looking as far removed from elite standard as is possible, John Stones caught flat footed for the second. City were good going forward, but vulnerable when attacked – and Monaco are always going to get on the front foot under Jardim. 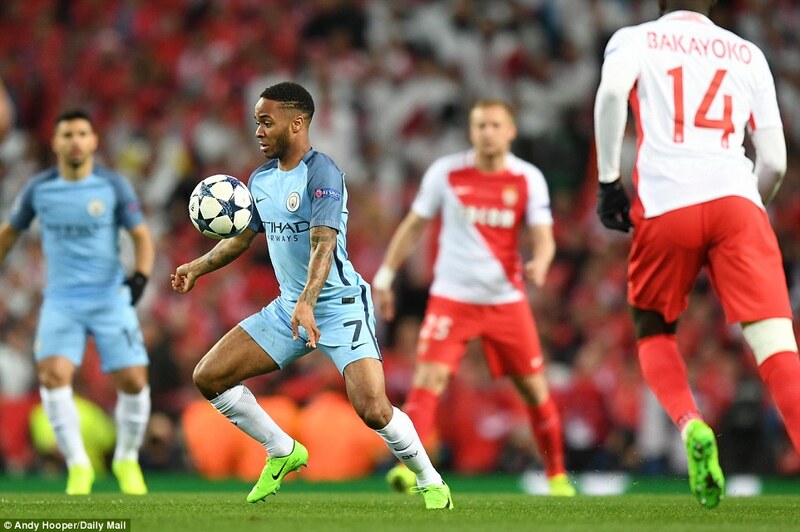 It started well enough for the hosts, the hugely impressive Leroy Sane shooting over after seven minutes, Monaco’s defensive rock Kamil Glik booked for a foul on him moments later – and out of the return leg. 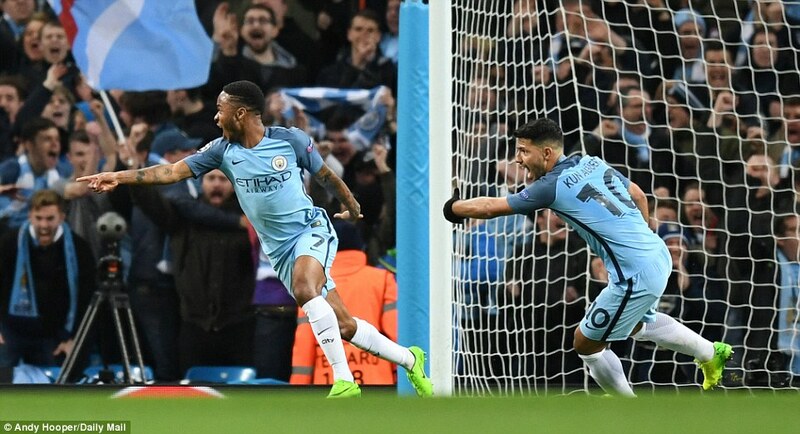 In the 14th minute, Kevin De Bruyne found Rahem Sterling who was thwarted only by the quick response of goalkeeper Danijel Subasic. So far so good. Yet, in the 18th minute, a warning. Falcao turned his man sweetly in midfield, ran and picked out Tiemoue Bakayoko, whose shot was initially spilled by Caballero. Monaco showing their danger, City their frailty. As the half wore on, both elements became more apparent. But first, City scored. They had two chances in four minutes and the second produced a goal. The first should have, too. Sterling slipped De Bruyne in, and his cross should have been converted on the volley by Sergio Aguero. It is truly unusual to see him struggling for form, as he has of late. Sterling scored City’s opener, but Sane’s celebration were wildest, acknowledging his vital role. It was Sane in midfield, holding off a succession of challenges and keeping the ball under control, Sane who worked the ball to David Silva, Sane who made ground for the return and Sane who struck the cross. Sterling in a great spot, tucked it away. 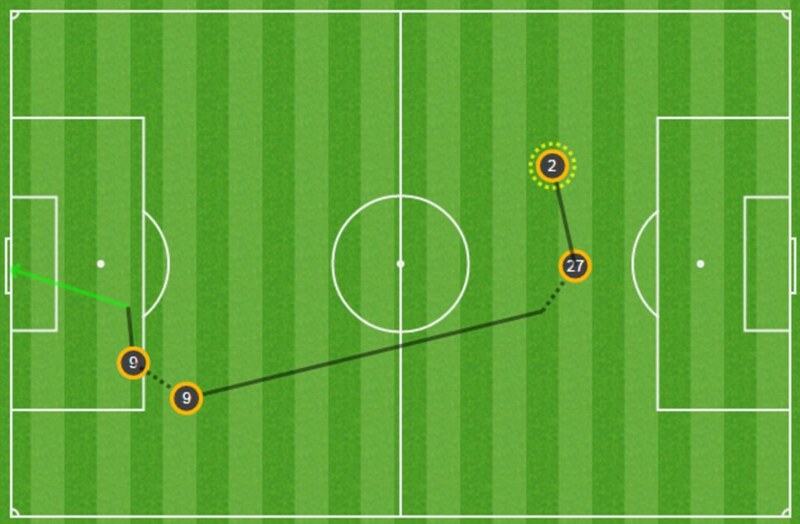 Sterling’s goal but Sane gets the assist: about four of them, in fact. 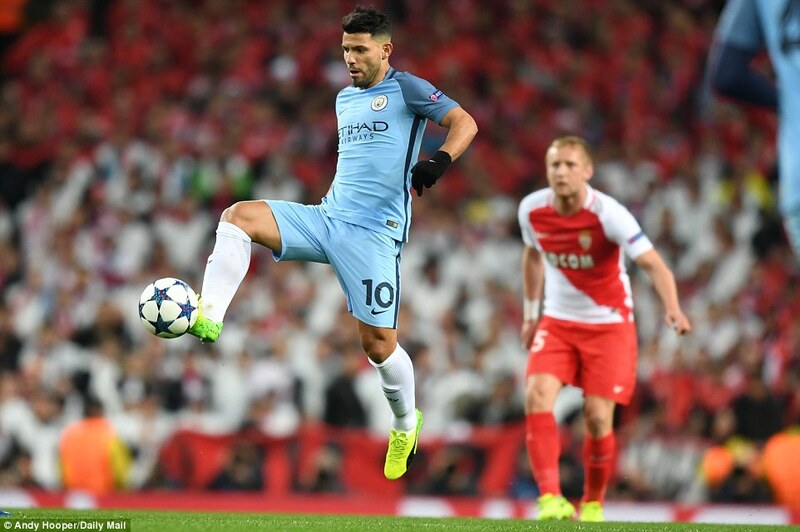 City’s flaws, however, are significant – and against a team with as much attacking flair as Monaco are always likely to surface. So it was from the visitors next forward move, five minutes later, that the equaliser came. Caballero was to blame. He tried to float a pass into midfield, failed miserably, and saw the ball mopped up by Fabinho. Guardiola turned to his bench a shrieked his frustration as if this was not, in part, his doing. Meanwhile, Monaco were on the march. Fabinho laid the ball off, got it back, and hit a deep, low cross that Falcao met with a magnificent diving header. Here, at last, was the player Manchester United thought they were getting. 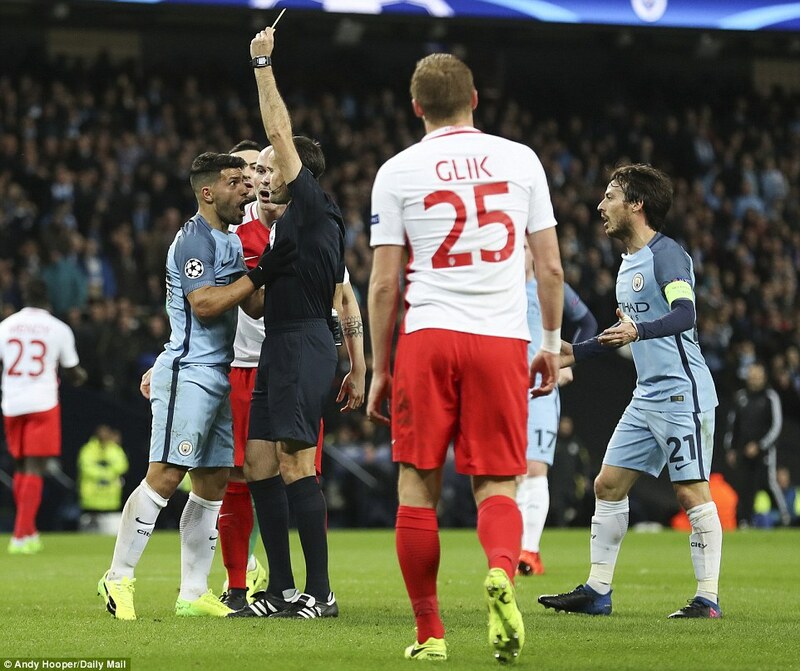 There followed the incidents that turned the game in Monaco’s favour, and turned the Etihad blue with fury. 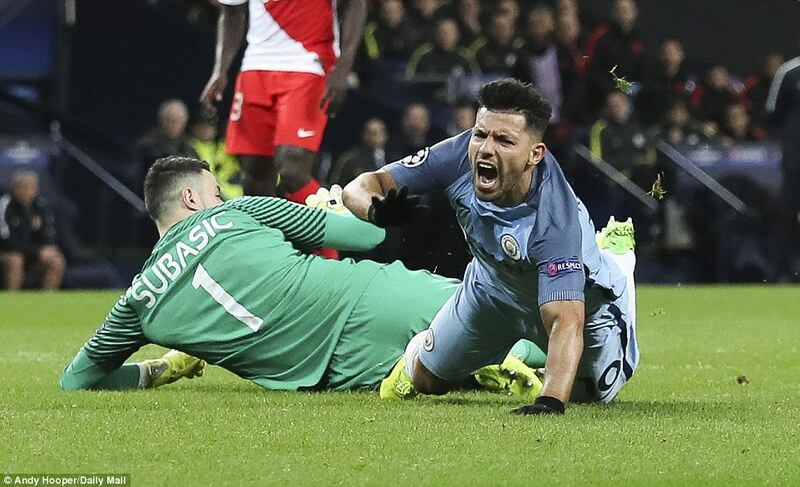 In the 34th minute, Aguero was put away, rounding Subasic only to be sent tumbling to the floor. Referee Antonio Mateu Lahoz marched up and brandished what many expected to be a red for the goalkeeper. Instead, it was a yellow, provoking groans. Then the locals realised it was a yellow for Aguero, for diving. Cue scenes. The mood was hardly improved when Yaya Toure was booked for a foul on Bakayoko – thanks to another pass from Caballero – and then Fernandinho followed him into the book. 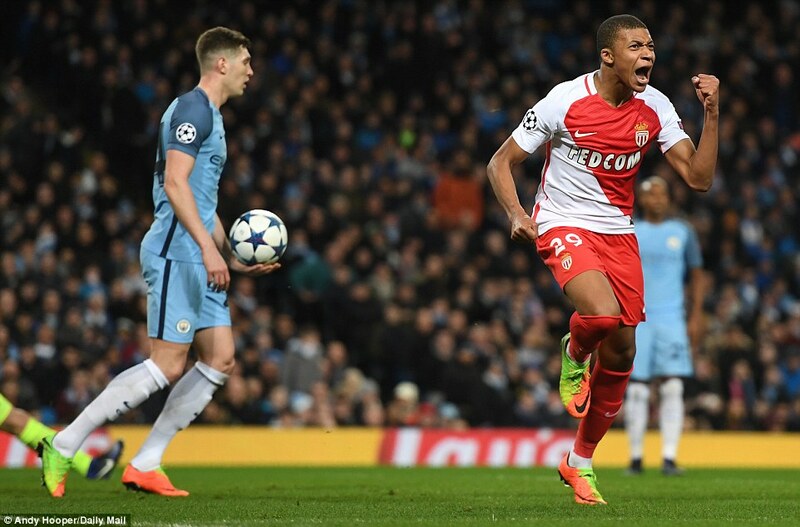 The free-kick was taken quickly, Kylian Mbappe was alert to it, Stone and Cabellero were not, and what started as a simple chip over the top was smacked smartly into the net as Monaco’s second. City’s fans stomped off at half-time moaning about the penalty – but the biggest penalty is playing Monaco with this defensive line.